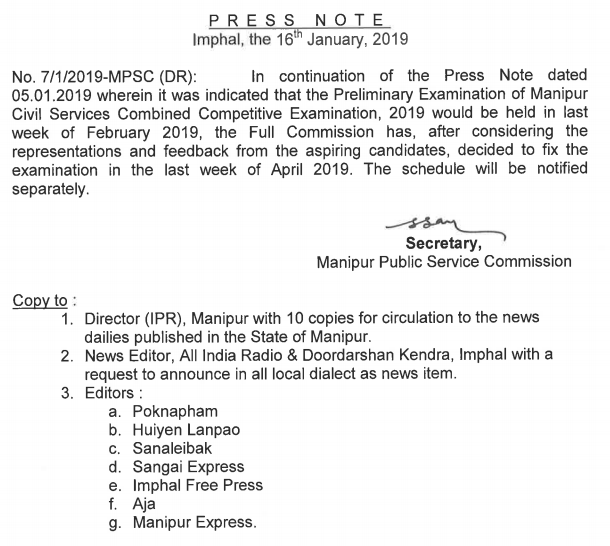 According to the Official notification released by Manipur Public Service Commission, MPSC it is informed to all the concerned that the Manipur Civil Service Combined Competitive Examination (MCSCC) Prelims 2019 has been fixed on the last week of April 2019. The scheduled of the examination to be notified soon. Earlier the MCSCC Prelims 2019 was fixed on last week of February 2019. The Commission has released the notification for recruitment of 70 post through Manipur Civil Service Combined Competitive (MCSCC) Examination 2019 under the Manipur Public Service Combined Competitive Examination Rules 2018.